I've been contemplating this for a while, and finally mustered up the courage to ask for some help! My mom has been sick with a myriad of illnesses for quite some time now (asthma, diabetes, blood pressure problems, eye issues, heart issues, mobility issues, etc.) and she is currently hospitalized for yet another bout of cellulitis in her leg. I think it would bring her a lot of joy (and warmth, she gets cold easy) for her to have her own comfortghan. I have yarn to do an afghan for her, but I just don't have the time between working and taking care of her. 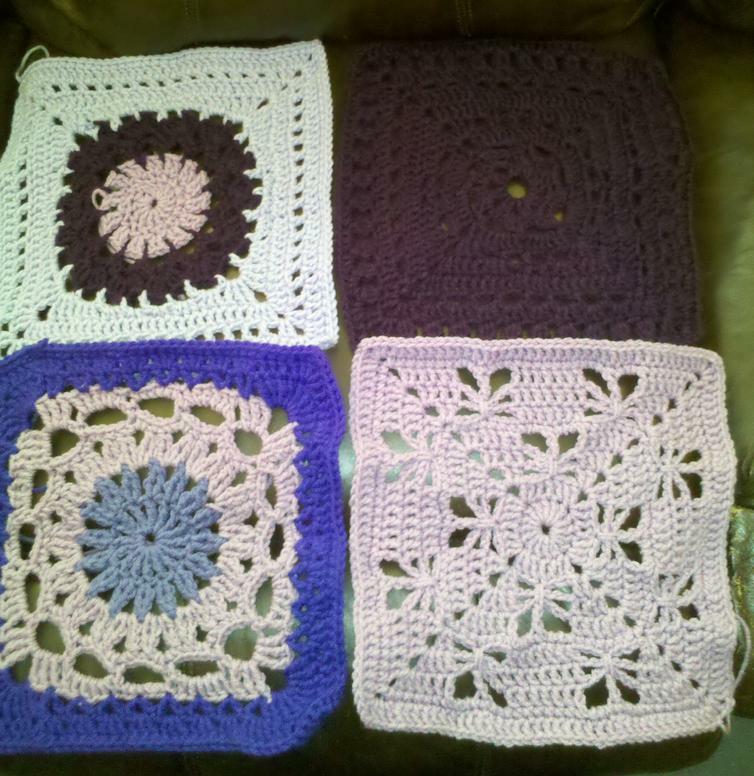 I'm asking for 12" squares, in any pattern, in any shade of purple (it's her favorite color). My goal would be to make the ghan 5 feet across and 6 feet long, so I need 30 squares. Any help would be greatly, greatly appreciated! PM me if you have any questions or if you need my address. Update 12/30/10: As of right now, I have 17 squares in hand, with the final 13 promised by two ladies! I want to thank all of you for your kindness and generosity in helping me with this project. I am currently working on edging the squares I have and as soon as I stitch everything together, I'll be sure to put up lots of pictures! Update 3/27/11: I currently have 18 squares in hand, and I'm fairly certain I will receive 3 that were promised, but the remaining 9 squares are still needed! 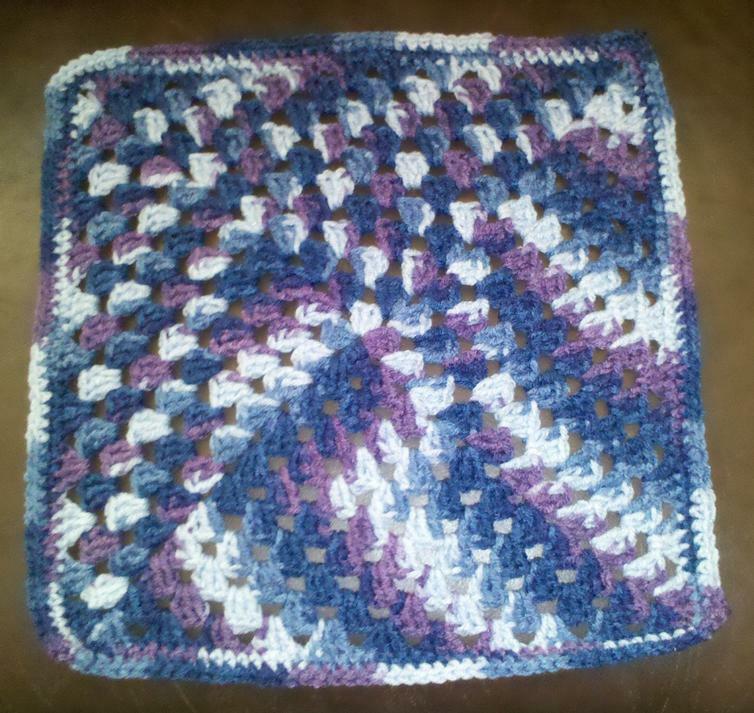 Update 3/29/13: I only have 18 squares, so I'm going to make 2 more and turn this into a lapghan for my aunt. Thank you for everyone who has participated, and I can't wait to show off the finished product! I am assuming acrylic such as RHSS? Square in purple (my favorite color) will be done this week for you. Prayers and wonderful wishes coming along with it. I've got one finished and ready to go out Weds. PM me your address and I'll get it in the mail to you! Thank you SO much! PM comin' your way! Please PM me with your address. I can get one out to you within a week. That's not a silly question, I actually asked the same one when I started making squares. You measure across the middle of the square. squares coming your way! sent them today.hope your mother is feeling much better. mine went out today too! My mom is still in the hospital--was planning on getting moved to rehab tomorrow, but had a setback yesterday when physical therapy couldn't hold her up when tranferring her to her bed and they had to sit her down on the floor (on top of her bad leg) and it fractured her fibula and two toes. She will be in rehab for a much longer time than originally anticipated. Mandy, I am so sorry to hear about the set back. I hope things get better soon for you and your mom. Her square is going out by the end of this week. It's package, just need to get to the post office. PM me you address, and I will get out one, hopefully two. Thank you Tiffani for the beautiful square you sent! I love the purple/blue variagation in the yarn you used--so pretty! I'll get a picture up soon! Do you still need squares? I would gladly make a few for ya! Absolutely! Right now I have 5 in hand with a few more promised, and I'd like to have 30 squares for a 5' by 6' afghan. I'll PM my address to you. 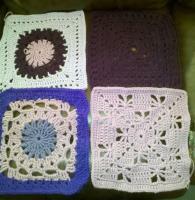 Thank you to grannytme for the 4 beautiful squares you sent me!